As far as healthy desserts for kids go, this recipe is super easy. 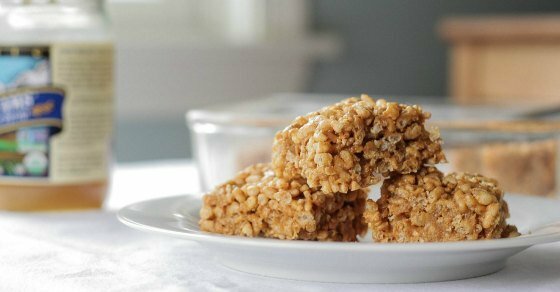 Your kids will have no clue these brown rice, low-sugar, peanut butter rice krispie treats are actually good for them! Sometime in the middle of toddlerhood, it happened. Deep down I hoped it never would, but after multiple birthday parties, holiday gatherings, and visits to friends’ houses, my oldest daughter acquired a taste for sweets. If I were honest with myself I knew this day would come eventually. I mean, with my own addiction habit of eating Ghirardelli chocolate chips every evening, who was I kidding? But in the la-la land of my idealistic goals for my daughter, one was that she wouldn’t need or even want sweet treats. Because let’s be honest, in the culture we live in lollipops are in just about every shop we visit. Candy is now thrown from floats during Fourth of July parades and every gathering with friends – whether our own or our kids – inevitably includes some chocolatey or sweet indulgence. The world is stacked against parents trying to raise kids who don’t have a taste for sweets. So eventually I caved, but not entirely. While we do occasionally have cookies, ice cream or even (gasp!) brownies in our house, I try my best to offer my kids desserts that at least have some nutritional value. It’s not always easy, but I’ve found a few desserts that do the trick. 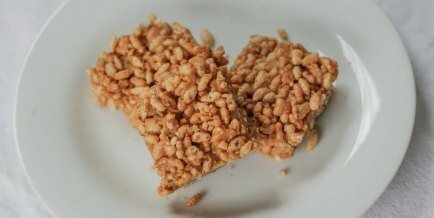 This recipe for peanut butter rice krispie treats was one of the first healthy dessert recipes I tried and fortunately, my kids are TOTALLY fooled (husband included). Every time they bite into a semi-sweet crunchy square they have no idea they’re eating nutritious brown rice and protein-rich peanut butter, plus a lot less sugar than the traditional marshmallow kind. Win. Win. The great thing about these treats is that they can be whipped up in a matter of minutes. The only stumbling block might be some of the less well-known ingredients. But DON’T WORRY! Even though most of this recipe’s ingredients can be found in grocery stores or online, a few aren’t as readily available. But easy substitutions exist that result in equally yummy treats. Brown Rice Crisps: You can find these under the 365 brand at Whole Foods, but if you don’t have a Whole Foods near you and have no idea where to find brown rice crisps, good ole Rice Krispies also work. 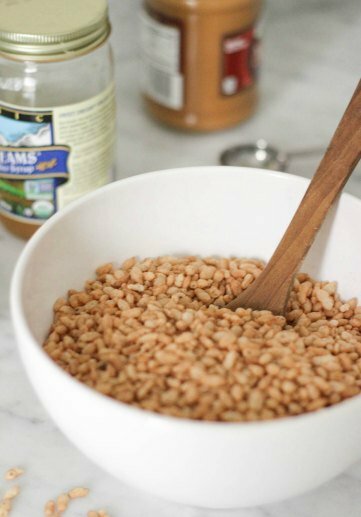 Note that while brown rice syrup can be substituted with maple syrup or honey, both of these alternatives are sweeter so you may want to adjust accordingly. Also, the recipe below will result in a slightly crumbly bar. If you want less crumble, add more brown rice syrup which will also make the treat more sweet and less peanut-buttery. Place brown rice crisp cereal in a large bowl and set aside. 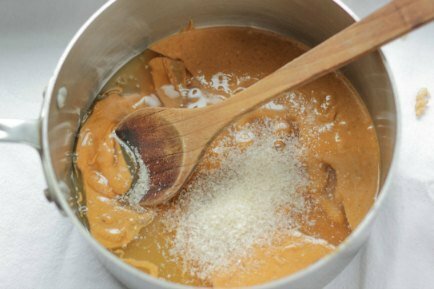 Combine the peanut butter, brown rice syrup, salt and gelatin or agar flakes in a medium saucepan and heat on low, stirring constantly until combined and slightly bubbling. Pour peanut butter mixture into rice cereal and stir until combined. Then pour combined mixture into an 8 X 8 inch pan, cover and place in refrigerator for at least an hour. Once set, cut into squares and enjoy! Want to be a cool mom while still maintaining your integrity? Let your kids think they’re eating dessert for- get this – a snack. And these rice krispie treats fit the bill. “Hmmm….” I said, trying to put on my best impression of thinking through a really tough decision. After a few moments of deep contemplation, I said, “Well, perhaps just this once,” knowing full well this was a far better choice than even a granola bar or dried fruit. “Cool, thanks!” she said and then bragged to her sister about her achievement. So while I’ll never win an award for keeping my daughters off of sweets (as if that was a realistic goal anyway), I suppose a good runner-up is getting my kids to think I’m a cool mom for letting them eat a dessert for snack time.